Laser Beam Machining (LBM) is a form of machining process in which laser beam is used for the machining of metallic and non-metallic materials. In this process, a laser beam of high energy is made to strike on the workpiece, the thermal energy of the laser gets transferred to the surface of the w/p (workpiece). The heat so produced at the surface heats, melts and vaporizes the materials from the w/p.Light amplification by stimulated emission of radiation is called LASER. It works on the principle that when a high energy laser beam strikes the surface of the workpiece. The heat energy contained by the laser beam gets transferred to the surface of the w/p. 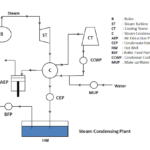 This heat energy absorbed by the surface heat melts and vaporizes the material from the w/p. In this way the machining of material takes place by the use of laser beam. 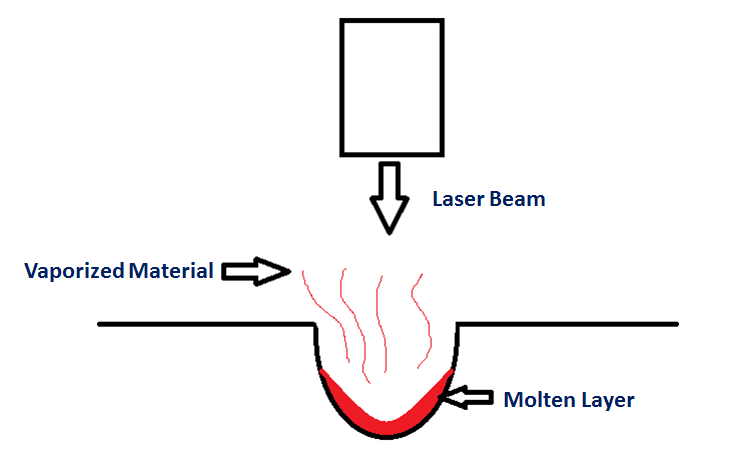 How Laser Beam is Produced? Laser: light amplification by stimulated emission of radiation is called laser. Before understanding how laser beams are produced, we must need to learn about what is stimulated emission. In normal condition, the electrons present in atoms lies in the ground state (lowest energy level). When some source of energy is provided to the atoms in the form of radiation, the electrons of the atoms absorbs energy and excited to higher energy level. After a short duration, these electrons automatically jump back to the ground state and while doing so they emit photons of light. This emission of photons by the electrons is called spontaneous emission. When the electrons in the excited state do not jumps back to the ground state by its own. This situation is called meta-stable state. When a photon is fired to the meta- stable state of atoms, this stimulates an electron at excited state and it jumps back to its ground state giving of two photons (one photon that we fired and other produced by the electron). These two photons stimulate other atoms electrons and produces more photons- a chain reactions starts and number of photon increases. This process is called stimulated emission as we are stimulating other electrons to get photons. Here we are getting two light photons from a single photon i.e. amplifying the light (increasing the light). Hence the light beams produced by this method is called laser (light amplification by stimulated emission of radiation). 1. 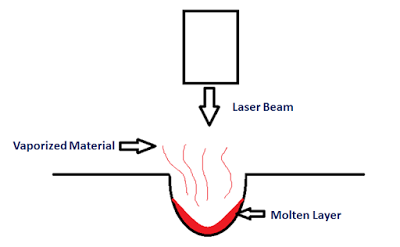 Gas Lasers: In these types of laser, gases are used as the medium to produce lasers. The commonly used gases are He-Ne, argon and Co2. 2. Solid State Lasers: The media of the solid state lasers are produced by doping a rare element into a host material. 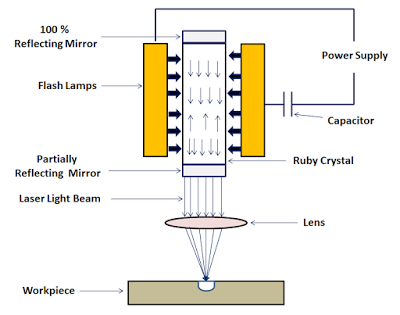 Ruby laser is an example of solid state laser in which ruby crystal is used as medium for the generation of laser beam. (i) YAG: For yttrium aluminum garnet which a type of crystal. 1. 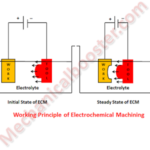 A pumping Medium: A medium is needed that contains a large number of atoms. The atoms of the media are used to produce lasers. 2. Flash Tube/Flash Lamp: The flash tube or flash lamp is used to provide the necessary energy to the atoms to excite their electrons. 3. Power Supply: A high voltage power source is used to produce light in flashlight tubes. 4. Capacitor: Capacitor is used to operate the laser beam machine at pulse mode. 5. Reflecting Mirror: Two types of mirror are used, first one is 100 % reflecting and other is partially reflecting. 100 % reflecting mirror is kept at one end and partially reflecting mirror is at the other end. The laser beams comes out from that side where partially reflecting mirror is kept. A high voltage power supply is applied across the flash tube. A capacitor is used to operate the flash tube at pulse mode. As the flash is produced by the flash tube, it emits light photons that contain energy. This light photons emitted by the flash tube is absorbed by the ruby crystal. The photons absorbed by the atoms of the ruby crystals excite the electrons to the high energy level and population inversion (situation when the number of exited electrons is greater than the ground state electrons) is attained. 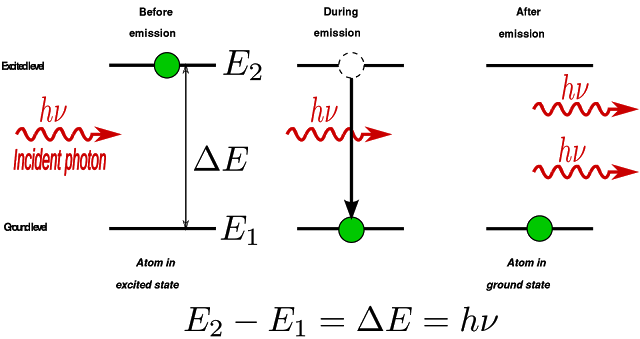 The emitted photon stimulates the excited electrons and they starts to return to the ground state by emitting two photons. In this way two light photons are produced by utilizing a single photon. Here the amplification (increase) of light takes place by stimulated emission of radiation. Concentration of the light photon increases and it forms a laser beam. 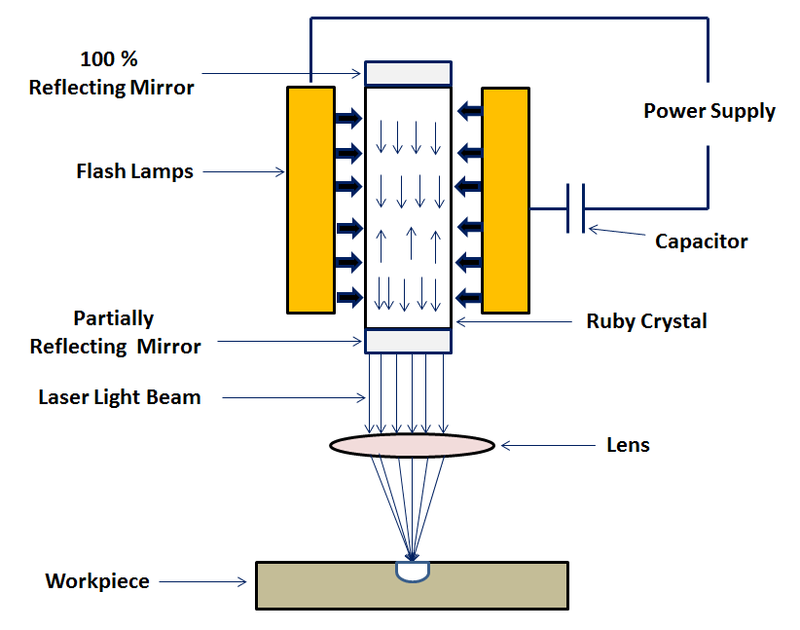 100 % reflecting mirror bounces back the photons into the crystal. Partially reflecting mirror reflects some of the photons back to the crystal and some of it escapes out and forms a highly concentrated laser beam. A lens is used to focus the laser beam to a desired location. A very high energy laser beam is produced by the laser machines. This laser beam produced is focused on the workpiece to be machined. When the laser beam strikes the surface of the w/p, the thermal energy of the laser beam is transferred to the surface of the w/p. this heats, melts, vaporizes and finally removes the material form the workpiece. In this way laser beam machining works. It can be focused to a very small diameter. 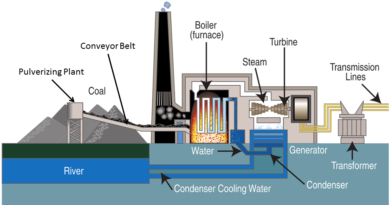 It produces a very high amount of energy, about 100 MW per square mm of area. It is capable of producing very accurately placed holes. Laser beam machining has the ability to cut or engrave almost all types of materials, when traditional machining process fails to cut or engrave any material. 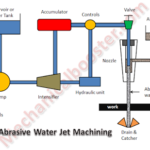 It can be paired with gases that help to make cutting process more efficient. It helps to minimize the oxidation of w/p surface and keep it free from melted of vaporized materials. Produces a very high energy of about 100 MW per square mm of area. It has the ability to engrave or cut almost all types of materials. But it is best suited for the brittle materials with low conductivity. High initial cost. 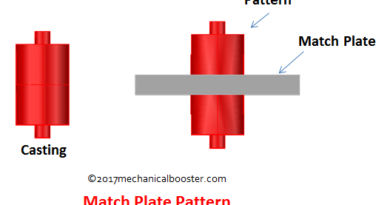 This is because it requires many accessories which are important for the machining process by laser. Highly trained worker is required to operate laser beam machining machine. Low production rate since it is not designed for the mass production. It requires a lot of energy for machining process. It is not easy to produce deep cuts with the w/p that has high melting points and usually cause a taper. The laser beam machining is mostly used in automobile, aerospace, shipbuilding, electronics, steel and medical industries for machining complex parts with precision. In heavy manufacturing industries, it is used or drilling and cladding, seam and spot welding among others. In light manufacturing industries, it is used for engraving and drilling other metals. In the electronic industry, it is used for skiving (to join two ends) of circuits and wire stripping. In medical industry, it is used for hair removal and cosmetic surgery. 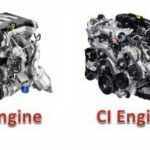 ← What is Electrical Discharge Machining (EDM) Process and How it Works?